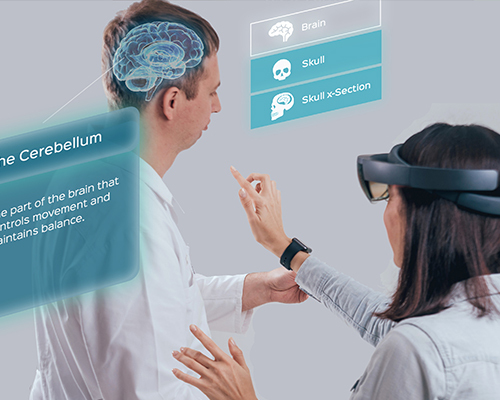 This immersive Mixed Reality experience lets students vizualize, explore and understand the complexities of the human anatomy as a team. Layering the various systems in 3D offer the students a better appreciation on how the systems come together in our anatomy. They will also get to see the skull and brain on their teammate’s head. This fun interactive exercise let the student see how this vital organ sits protected within our head and also let them learn about the various key areas and functions of the brain. Explore the complexities of the human biological systems. Learn the various key parts and functions of the brain. A full scale 3D human hologram renders. Students can toggle on and off the different biological systems to explore each system and how they come together as a whole. 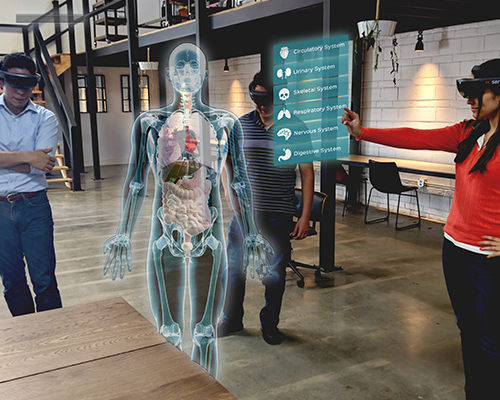 The student team will then test their knowledge with a quick-fire 3D Mixed Reality “Operation” game. Students will then see the human skull superimposed on thier teammate’s head. They will be able to toggle through to see the brain located within the skull then just the brain only. Each part of the brain can be highlighted to provide information of its function.